Nice. I spy blue anodized Topline crankset. Is this a repair or a trade in? ^In Top's defense, at least it appears to be resting on the bottom cushion and not fully clamped in. 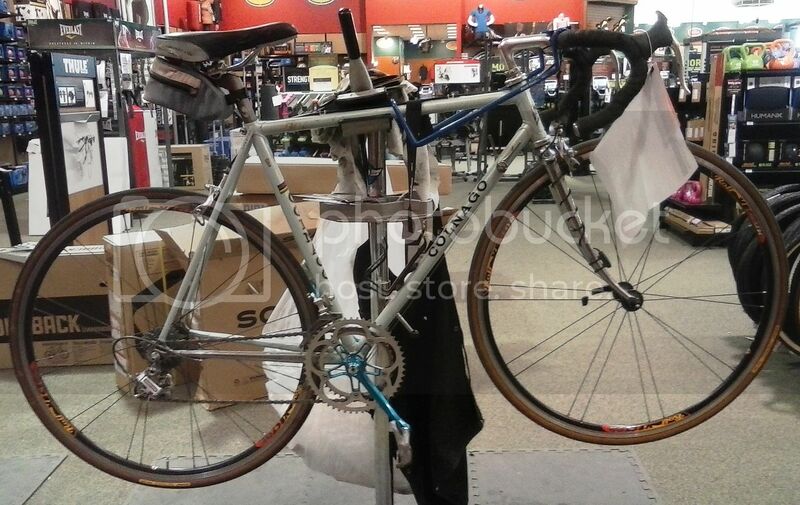 I'm hoping the customer brought it in for a different saddle and more spokes. Repair. If it were a trade in it would be hanging in my barn by now. Very true, just hanging there while I replaced a tube. Should leave the owner a note to look into a wireless computer. There is nothing wrong with clamping on the top tube if you have basic muscular control over your body. Not that it was clamped in this photo anyway. I'll take a wired computer every day of the week. I tried wireless and threw it into the for trade pile.